This was an unexpected journey. I was actually planning to go home after the Idukki bus fanning trip, spend a day there and then head back to Bangalore. But some twist in the tale meant that I had to search for tickets for my return journey. The second day schedule of the busfanning trip was still not very clear – so I was not very sure where to keep my boarding point at. After spending a full day on Google Maps, I figured out the exact route that we’d be travelling on and also figured out exit plans. I decided to book a ticket from Kottayam. Now, the next question was – which bus? I had to choose between the two Kalladas. The elimination round was quick – the G4 buses did not have tickets – I quickly decided to select the Kallada (Suresh) service via Kumily. Tickets were booked through a third party website to save some money (thanks to the discount coupons). I chose a seat towards the front this time – B1 it was. I remembered that I hadn’t taken a print out only on the day of my journey! The SMS sent by the booking site to my phone claimed that I did not need a print out – the SMS was valid as an m-ticket according to the message. I wanted to make sure that the message would work – lest they make a scene while boarding. I headed out to the Kallada office near Kodimatha bus station in Kottayam about 3 hours before the scheduled departure time. The guy at the office confirmed that my message was indeed valid – he quickly cross-checked my booking with the reservation chart as well. I was now relieved – so I had lots of time to spot some more buses. I walked around for some more time. After some bus-spotting, and a re-union with fellow bus fans (who were part of the Idukki expedition), I had some refreshments and returned to Kodimatha – reaching there around 1730hrs. The guy at the counter marked me “present” on the reservation chart and told out the bus number – “7639” to me. 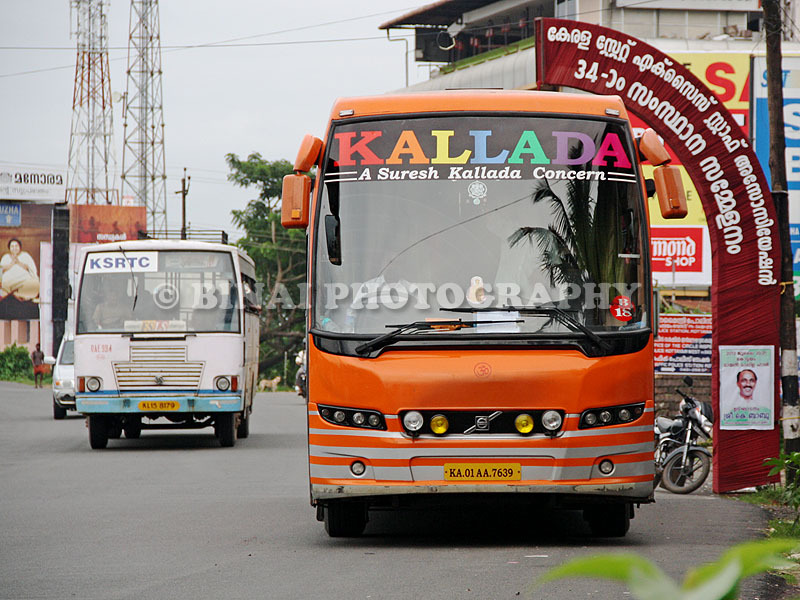 The bus: KA-01-AA-7639 of Kallada coming in for pick-up. We had a pick-up at Kanjikuzhy (1807hrs) – right after Kottayam. I was dead tired after the two days of travelling, and hence my first priority was to push my back-rest to the maximum and doze for some time. I did not notice if we had any pick-ups till Ponkunnam – we reached there at 1853hrs. Here, another pick-up list was given to the cleaner. The pick-ups were still outside churches and even outside some houses! The next major pick-up point was Kanjirappally – at 1859hrs. It took a lot of time here – a lot of people got in, and each one had lots of baggage. We started from here at 1904hrs. The next pick-up point was Mundakkayam – 1929hrs. We stopped here to pick-up one passenger – but five of his friends got into the bus to see him off. They wanted to “see” the bus. We finally started at 1933hrs. The ghat started after Mundakkayam. Just as we started from Mundakkayam, the attendant came around distributing vomit bags. The bus kept swaying side-to-side was we ran through the ghats. Some turns were tight – at one place, the bus had to back since another vehicle came across suddenly. A movie was being played while we were on the ghat – it did keep some people away from the thoughts of passing through a ghat – some others were busy unloading whatever they had stuffed before the journey started. Now I understood why not many people prefer this route, even though the route was shorter and faster. We picked up another passenger at Peerumedu (2024hrs) – the crew had to struggle a bit to find out the pick-up location though. We stopped again at Vandiperiyar for pick-up (2058/2102hrs). I was a bit surprised – the pick-up time at Kumily was only 10pm, and we were already close to it. We stopped for dinner at a hotel at Kumily – at 2127hrs. That was a good place – a clean restaurant, but very small, slow and did not have much options. The service was lousy as well. But I had a chance to speak to one of the guys managing the hotel – they expressed some concerns about the inconsistent loads in the bus. But they did agree to speed up the service by having some items ready. The bus started after dinner at 2158hrs. After about a kilometre, the bus stopped for pick-up, somewhere near the bus station (2159hrs). It took some time here – the checking guy took a head count, filled up the waybill and signed off for the departure. We started off finally at 2208hrs. Two more drivers got in here – the guy who was driving was to get off at Cumbum (his hometown). I slept off soon after Kumily – I remember the bus starting to descend the ghat, but slept off even before we passed lower camp. I had one very nice sleep – woke up sometime around 0300hrs – the bus was stationary then. 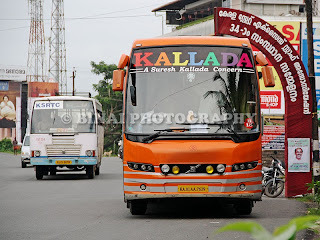 Another S.Kallada bus gave us company. I slept off again as the bus started off from there – I vaguely remember the driver discussing about going via Rayakottai. 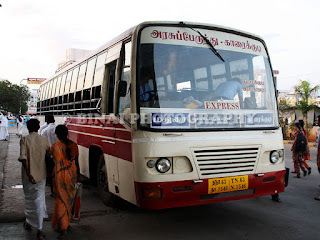 I remember the bus running through a rough patch – so we were surely going through the Rayakottai route. I woke up as we were nearing Hosur – saw a lot of local buses starting their day in that area. We stopped at Hosur for a drop at 0500hrs – the drop was handled very efficiently – the attendant went to the passenger, woke him alone. I dozed off for some more time, and woke up just as we stopped at Hebbagodi for a drop – 0523hrs. 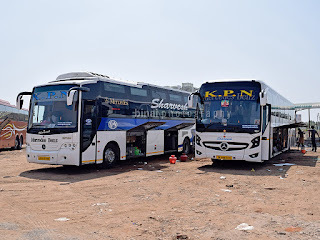 We were accompanied by two more S.Kallada buses – one was coming from Kodungallur (as told by our driver) and the second ones’ origin was said to be Trivandrum. We took BETL, and I was finally dropped off at Silk Board, at 0535hrs – well before the promised arrival time of 6AM. End remarks: The bus, KA-01-AA-7639, had about 5.99 Lakh kms. The bus was well kept – no rattles, no squeaks anywhere. The bus was due for its fitness certificate renewal – it had some dents on the exteriors, some were patched up. The end-to-end ride took about 11h38m – quite fast for the route – it’s about 40% 2-laned roads with a ghat section thrown in. 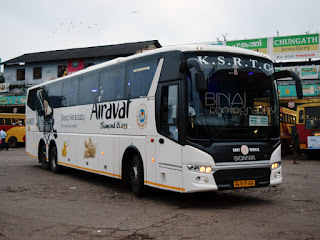 The service was quite good – a well behaved attendant, with good drivers – all the drivers who took to the wheels during the trip drove very well – no rash driving, absolutely no honking at night. In the last leg, they were talking a bit too loud in the cabin though. Will I take this service again? Sure, if I travel on that route again. Binai, have you ever tried SRS travels? If yes, is it a good service?